Learn to make Fruit Cream Rice Kheer Recipe - Indian Pudding Kheer Dessert recipe with video instructions. These individual desserts are an enticing and fusion amalgamation of chilled rice kheer, fruit cream, and chocolate. These ingredients are combined into a dessert worth trying definitely. 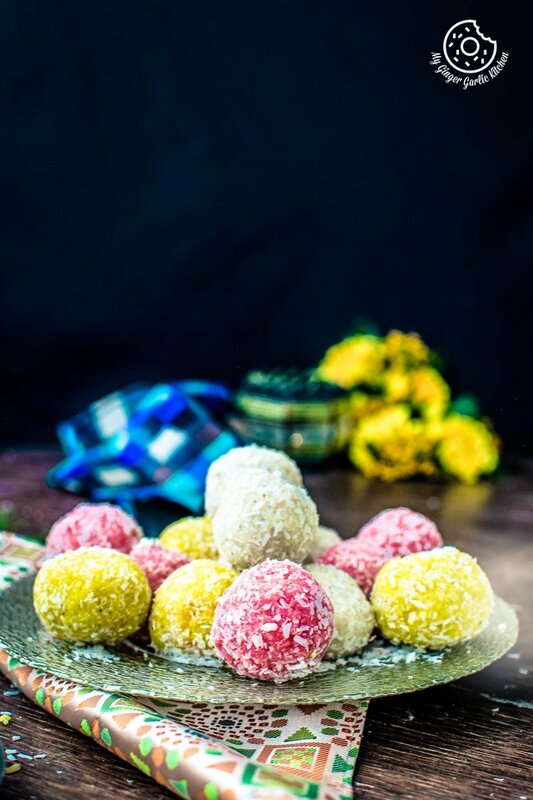 They have that sweet flavor and glorious texture of kheer, which is well blended with the delicious flavor of fruits and cream resulting in the divine taste. Dessert in individual portions always feels much better. This way you exactly know how much you can eat. The first glance at any individual dessert primes your brain and you know how much and what delicacy is gonna fill your mouth very soon. Isn’t it? 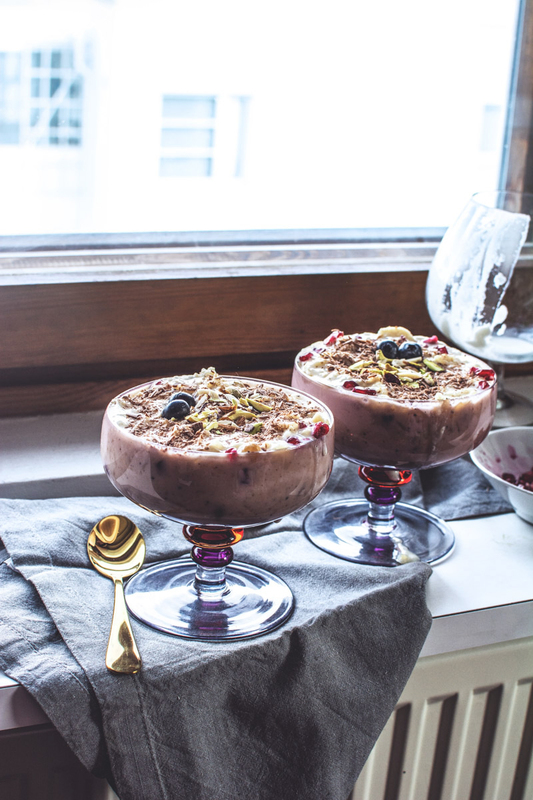 These Indian Pudding Kheer Dessert glasses are so cute. Undoubtedly, they taste wonderful too. How can they not taste good when we merge two of the most delicious desserts? 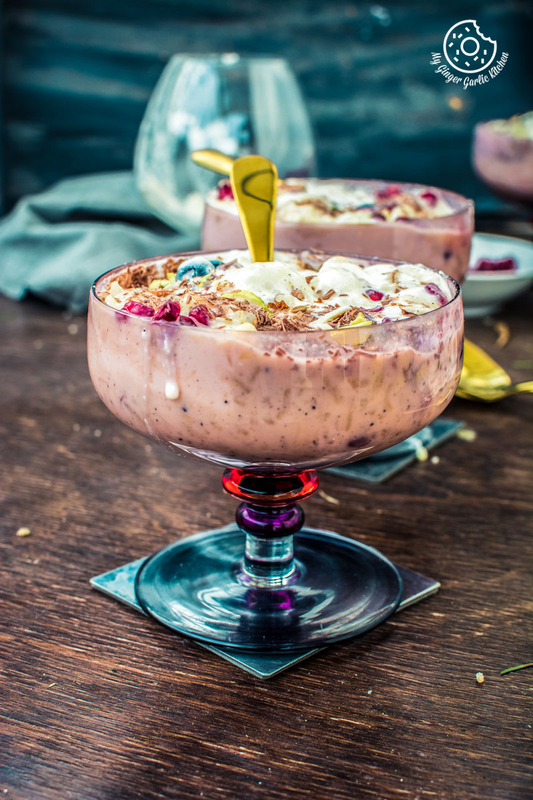 If you ask me, all fusion and 2-in-1 desserts are a big hit at my place, and these pretty looking kheer glasses are no exception. Oh my God! Oh my God! Easter is coming, so what should I make? This is the question many of you would be asking at about this time. Well, the potential answer is this recipe. I am sharing this today because the long Easter weekend needs some undecayed desserts. And because Easter is this Sunday, and also because I just wanted to share these with your before the long weekend. Guys, do you remember when I told you about my hate-love affair with the Rice Kheer? But this time I am sure you must have noticed that now I do admire my sweets. Seems like I have started loving them even more with every passing day. How peculiar is that our taste glands evolve over the years, and we start cherishing the dishes we hate? Does that happen to everyone, or is it just me? Is It possible to have dessert for meals? Today’s dessert ‘Fruit Cream Rice Kheer’ however, does not include any kind of laborious work, if you already have leftover kheer. You only need chilled kheer and 10 mins to make this easy peasy, yet one of the most exotic dishes. This dessert came to life when I had a good amount of leftover kheer. My family and I are pretty happy with the leftover kheer itself, but this time we wanted to take a step forward. So I made this super dainty and so gratifying fruit cream rice kheer. Everyone loves a traditional dessert, but if you’re ready to put a palatable twist, try this one. Rice Kheer aka chawal ki kheer is a popularly delicious and authentic dessert throughout India. It is called by different names across India – Payasam, Khiri, Payesh etc. Although the names are different, the cooking procedure is quite similar. 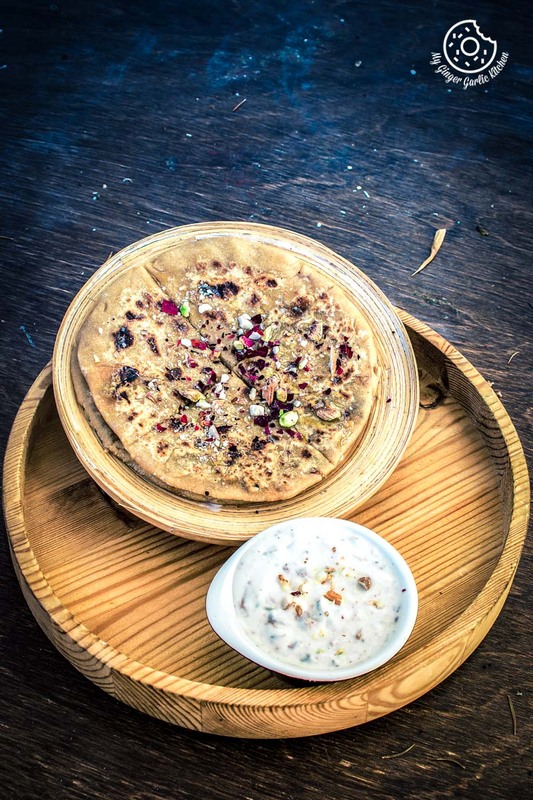 This rice pudding is a classic, rich and creamy Indian rice pudding cooked with rice and milk is delicately flavored with cardamom, saffron and rose water. Full fat milk is evaporated to half during the cooking process to produce a thick, creamy base. It’s a perfect fusion dessert for Parties. 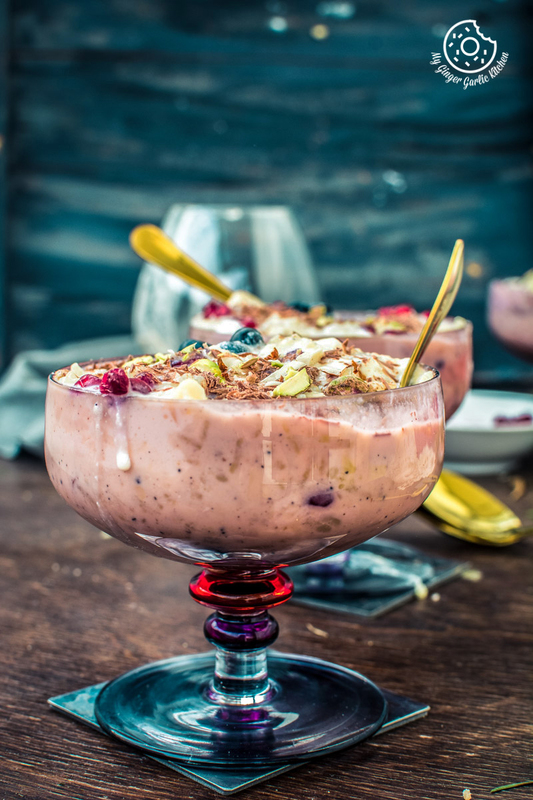 This marvelous Fruit Cream Rice Kheer is a great option when you want to create something interesting for parties or get-togethers at home. I have made it a couple of times and this Fruit Cream Rice Kheer is liked by everyone who loves kheer. 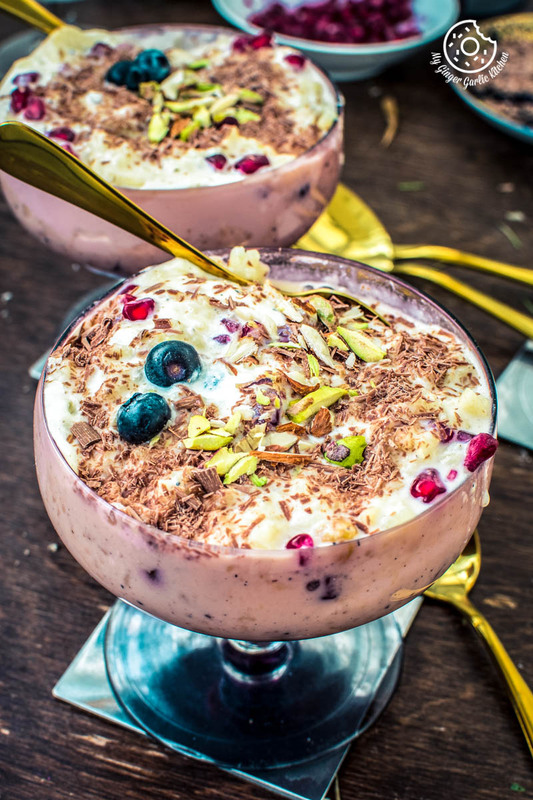 This fantastic and appealing fruit cream rice kheer is layered with chilled kheer, whipped cream, blueberries, bananas, and pomegranate arils. This slight fruity flavor of fruit cream with the kheer pairs nicely with the rice kheer. For the innovation of this fancy fusion dessert, I have used leftover chilled kheer for this recipe. You can check out the kheer recipe. This fusion dessert tastes out of the world. And absolutely uncomplicated and easy to assemble. No baking or cooking is required. Why there’s so much to love about them? This dessert is extra sweet, delicate, and extra fluffy. This dessert is dense as a rice kheer should be, and light and airy as whipped cream should be. So this dessert is dense and airy at the same time. How charming is that? 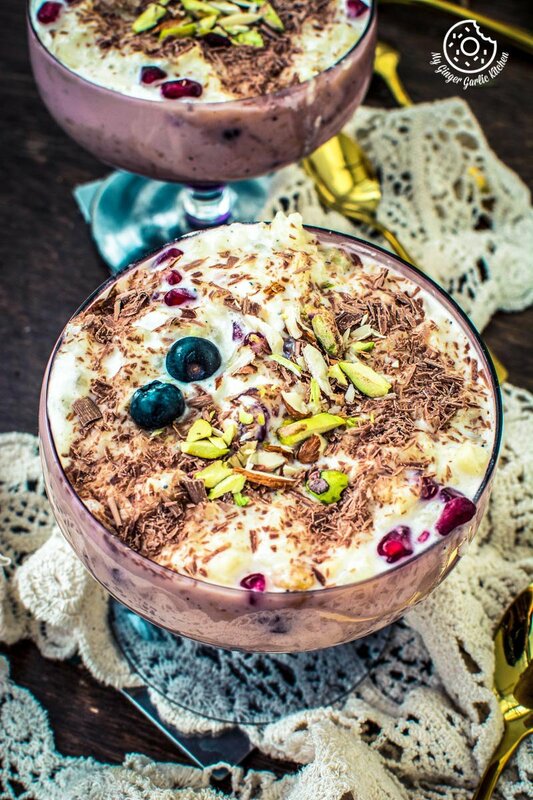 This slight fruity flavor of fruit cream with the kheer pairs nicely with the rice kheer. 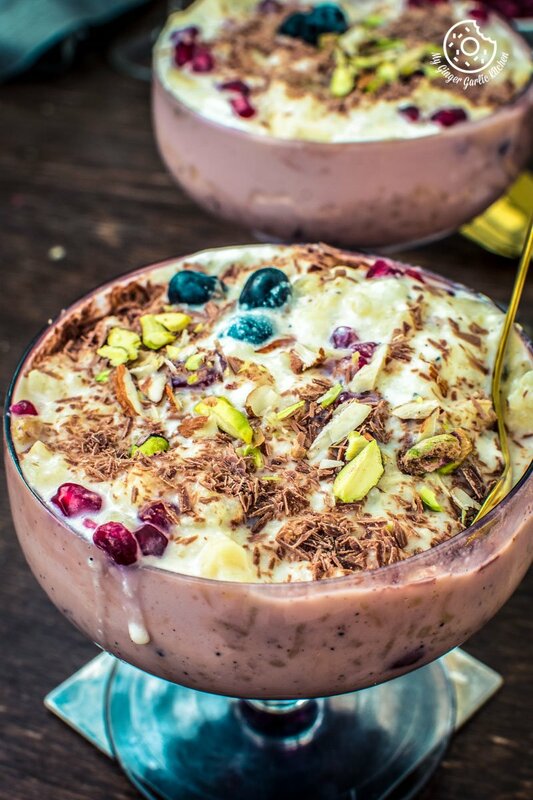 The best part about this Fruit Cream Rice Kheer? They are child’s play. Yes, I promise. Make it and I am sure you will love it as much as I do. Learn Fruit Cream Rice Kheer Recipe I Indian Pudding Kheer Dessert recipe with video instructions. . These individual desserts are an enticing and fusion amalgamation of chilled rice kheer, fruit cream, and chocolate. These ingredients are combined into a dessert worth trying definitely. They have that sweet flavor and glorious texture of kheer, which is well blended with the delicious flavor of fruits and cream resulting in the divine taste. 1. Layer 1/4 cup chilled whipped cream into the bottom each of 4 dessert glasses. 2. Arrange 2 tbsp blueberries or strawberries over whipped cream. 3. Layer each glass with a ladleful of chilled rice kheer. 4. Layer with whipped cream. 5. 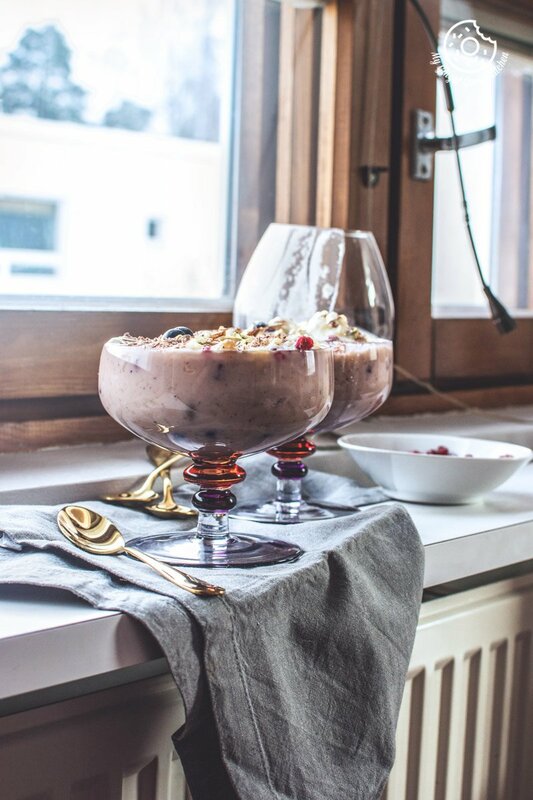 Top each glass with 7-8 banana slices and 2 tbsp pomegranate arils. 6. 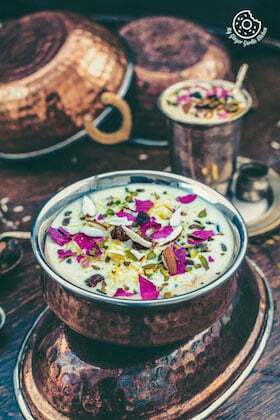 Layer each glass with another ladleful of chilled rice kheer or until glasses are filled to the top. 7. 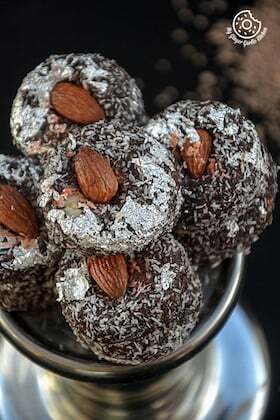 Garnish with chocolate shavings and chopped almonds and pistachios. 8. Serve fruit cream rice kheer chilled. 1. You can also use any other fruits of your choice.